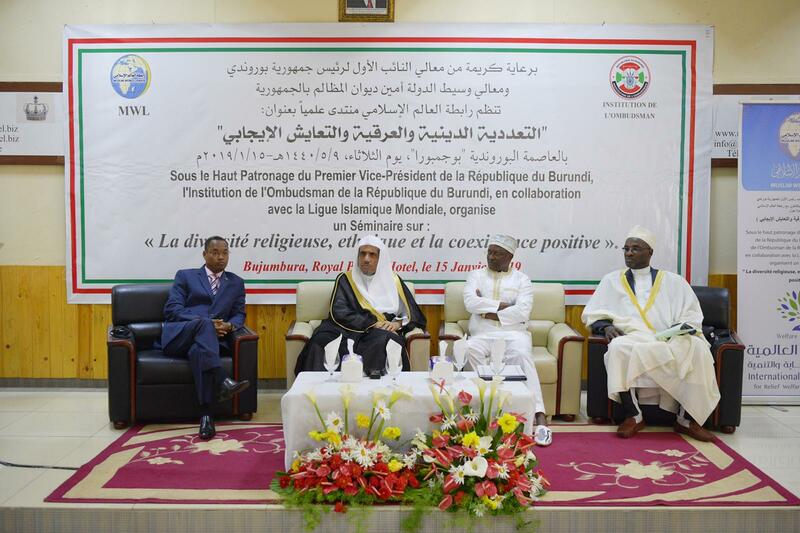 The Vice President of Burundi Inaugurates the International Forum of the Muslim World League on "Religious and Ethnic Pluralism and Positive Coexistence"
-The Vice-President appreciates the role of the MWL, which is actively involved in promoting the harmony and peace of peoples and nations. -Under the patronage of the President of Burundi, MWL’s Forum emphasizes the importance of initiating the principles of common and comprehensive citizenship in practical and sustainable programs. -Alissa: Positive integration of the national diversity is not an "option" but a "necessity" for the sake of peoples’ harmony and the peace of countries. -The Secretary General of the MWL: Wise people do disagree yet they don’t live apart. They engage in dialogue and reciprocate the love of good. They are linked with shared common bonds of their national and humanitarian goals. - Dr. Alissa: the language of understanding, tolerance and dialogue about common denominators and priorities, are the pillars of the dialogue of harmony and peace that will benefit the "human family" and the "national family"
- Secretary of the MWL: Basically, differences are a normal humanitarian scene, which is often a source of acquaintance and rapprochement; even a great human and rational enrichment; as long as its pure state isn’t adulterated into hate practices. - The Burundi Ombudsman: Muslims in Burundi are champions of coexistence, security and peace. - The Mufti of Burundi: Being the seal of all revealed religions, Islam’s solutions are valid across space and time. - Participants of the Pan-African Forum: the weight of the Rabita and the impact of its global mobility which transformed it from a league of Islamic coalition into the League of global harmony and peace. The International Forum organized by the Muslim World League in the Burundian capital (Bujumbura), entitled "Religious and Ethnic Pluralism and Positive Coexistence", was convened under the patronage of His Excellency the President of the Republic, Mr. Pierre Nkurunziza called for the promotion of positive coexistence in societies by way of consolidating the common and comprehensive citizenship principles, and also to activate common denominators and national and humanitarian priorities. The latter ties must be strengthened and an active participation in the development of the countries should be launched with an outlook towards the future. Societies should promote the spirit of love, tolerance and disseminate the culture of communication and coexistence between adherents of all religions. Calls of hatred and exclusion must be addressed, through the coordinating efforts of public and private bodies interrelated to the theme of the Forum to promote the spirit of productive communication between the followers of religions and cultures. These steps combined will galvanize the spatial and situational principles of common citizenship, in addition to the comprehensive sustainable process specifically structured by the contexts of each country’s programs. The Forum which saw the participation of the elitist religious, political and social leaders of different faiths, races and political tendencies, as well as intellectual, scientific and cultural institutions of the African continent, also called the Muslim World League to cooperate with public and private bodies in Africa to support development and prosperity projects. Social and different media platforms should be engaged to support the positive convergence between cultures and civilizations, and to serve the common goals. Religious and cultural institutions and all relevant civil society institutions have a significant role to play in this undertaking, which is supposed to publicly acknowledge with pride those pioneers for their were earlier and stronger teamwork to serve those humanitarian objectives in general and national specifically. The Forum’s participants noted the powerful weight of the Rabita and the impact of its global mobility which transformed it from a league of Islamic coalition into the League of global harmony and peace. For his part, in his inaugural address, HE Dr. Alissa stressed the keenness of the Rabita to extend bridges of communication and cooperation with all to attain our common humanitarian goals. Then, His Excellency the Ombudsman of the Republic of Burundi, Mr. Edouard Nduwimana, thanked the Secretary General of the Muslim World League for accepting our invitation and organizing this Forum in our country; a clear indication that His Excellency cares about coexistence and unity among people which are one of Islam’s values, and among the greatest values of Islam. The Quran mentions the word Salam (peace) eighteen times. Quite obvious; the religion of Islam is a religion of peace and love. Muslims in Burundi are champions of tolerance, security and peace; I say this and I am a Catholic. Then His Eminence the Grand Mufti of the Republic of Burundi, Sheikh Siddiq Kajandi, delivered a speech in which he explained that Islam as the seal of all revealed religions is keeping pace with time and place, it manages life with flexibility to achieve the interests of mankind, emphasizing the fact that Islam cares about connections and ties that link members of the same community regardless of their affiliations, religions or colors, as long as they live in one nation, yet this relation extends to include all humanity as a single unit of one origin; and this is the first foundation of the concept of tolerance which must prevail among the human race in their dealings and behavior. His Eminence stated that Islam recognizes pluralism and religious freedom as the basis of creation which must make the interaction between people natural, ruled by justice, parity and human sentiments. This undoubtedly contributes to the elimination of racial conflicts and extremist ideas that can lead societies to be divided and quarrel among one another; and this is what our Lord does not approve of. The Mufti of Burundi said: "These great and noble meanings need to be communicated and conveyed by a savvy person in an appropriate manner and good expression that will penetrate hearts and minds softly. In conclusion, the Dean of the Faculty of Foreign Languages at the University of Zanzibar in Tanzania, Dr. Issa Alhaj Zaidi, delivered the speech of the participants in which he elucidated that our loyalty to religions and ethnicities with their diversity and multiplicity makes us contemplate the many common bonds that unite us and converge together; for example: ethical and human values, and allegiance to nations, in addition, we contribute together in its architecture and its renaissance in cooperation with all individuals regardless of their diversity, backgrounds and persuasions away from partisan and sectarian narrow mindedness. The Dean of the College said: “Here and now, I launch a frank invitation to all to promote positive coexistence in communities by words and deeds. Let’s stand together, united to build the homelands, build the future, and consolidate the links of humanity and civilization. Dr. Issa also extoled the efforts of the Muslim World League in its relentless and endless efforts in extending bridges of cooperation to connect everybody, and to propagate the culture of peace and harmony among the people.